JANUARY 9: Suzuki can earn as much as $500K in playing time incentives, reports Mike Berardino of the St. Paul Pioneer Press. Bonus thresholds are tied to games started at the catcher position: Suzuki would earn $100K upon his 85th and 95th starts behind the dish and $150K apiece at the 105 and 115-start levels. DECEMBER 23: With Joe Mauer on the move to first base, the Twins had a need for a veteran catcher, and they addressed that issue today by announcing the signing of Kurt Suzuki to a one-year, $2.75MM contract that reportedly contains additional incentives. Suzuki is represented by the MVP Sports Group. 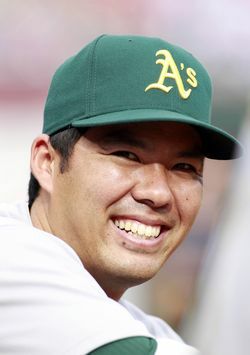 Originally drafted by the Athletics, Suzuki was traded from the A's to the Nationals in 2012. This past summer, he was traded from Washington back to Oakland. The 30-year-old batted .232/.290/.337 with five homers between Washington and Oakland. Suzuki has seen his power dip over the past two seasons, but he did average 14 homers per season from 2009-11. Suzuki has thrown out 26 percent of opposing base stealers throughout his career, though that number fell to 12 percent in 2013. He was significantly better in 2012, when he picked off 30 percent of potential thieves. In 2013, he was above-average in blocking pitches, per Fangraphs, and was average in terms of pitch-framing, per Matthew Carruth's report at StatCorner. Now that concussion issues have forced Mauer to first base on a full-time basis, Suzuki will split time behind the dish with rookie Josmil Pinto. The 25-year-old Pinto burst onto the scene in 2013 with a huge minor league line of .309/.400/.482 between Double-A and Triple-A. He followed that up with an even more impressive September cameo in the Majors, slashing .342/.398/.566 with four homers in 83 PAs. However, Pinto has been hampered by shoulder issues in Winter Ball and is not considered a strong defender behind the plate yet, so Suzuki could see a significant amount of time in the Twins' lineup. Switch-hitting outfielder/catcher Chris Herrmann could also see some time behind the plate if Pinto's shoulder problem lingers or if the Twins feel he needs a bit more work at Triple-A. Minnesota recently traded one of its catching options, Ryan Doumit, to Atlanta in exchange for lefty Sean Gilmartin. Though Suzuki doesn't hit as well as Doumit, he's a superior defender, which the Twins likely wanted to acquire given Pinto's inexperience and injury. In adding Suzuki, they've effectively upped their catcher defense in exchange for some offense while saving $750K. Susan Slusser of the San Francisco Chronicle first reported the agreement (Twitter links). Ken Rosenthal of FOX Sports reported the terms of the contract (Twitter link). Although not that much money for baseball teams, 2.75 million is too much for an all field no hit catcher who didn’t even field that well in 2013. It is my cell(iphone) or this app is going crazy?